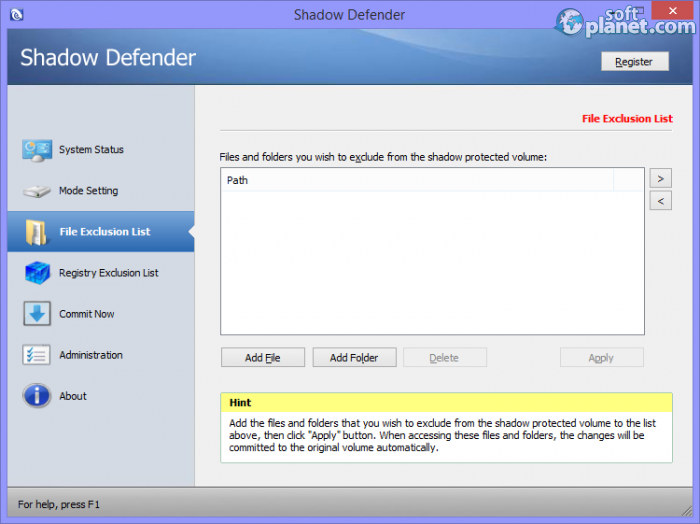 SoftPlanet makes it possible for everyone to get free Shadow Defender download directly from our servers. There is no registration needed for downloading. Shadow Defender 1.3.0.457 is one elegant and easy-to-use application that protects your computer from various threats in a slightly different way. It is designed to keep all malware and virus programs away using a unique technique. This app creates a clone of your real system files that are used by the computer in real time. All allowed and unwanted changes are applied to this virtual environment, so your real one remains unattended. A special mode, called “Shadow Mode” is used that redirects every change to be applied to your virtual environment. Once you experience a problem, you can easily perform a PC reboot and restore your system back to its original state, without wasting too much time and effort. 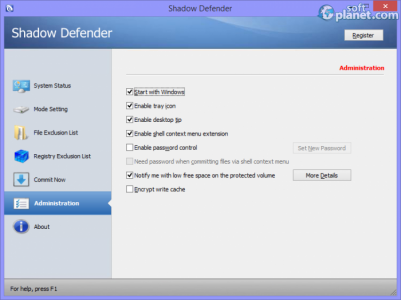 Shadow Defender is a perfect solution if you want to test various software, games or programs in a safe environment. It is also good protection against any changes from all shared users in public and educational institutions. At the same time your privacy is perfectly protected, because you can rely on this advanced protection utility. Best of all – anyone can use it on any computer and minimize every system downtime and all maintenance costs. This app gives you the flexibility to specify which files and folders will be added to the exclusion lists, which means that they will remain unattended upon PC reboot. Shadow Defender has a nice user interface that is used only if you want to change anything. There are no menus on top. In fact, they are replaced by tabs that are placed to the left. System Status is the first one that shows you the current program status, capacity, used space, free space and exclusion list path. In the Mode Settings tab, you can observe what the current volume status is and enable or disable it. This can happen with a single mouse click. A Schedule button allows you to schedule whether your computer will be in Shadow Mode next time or not. You can freely change that schedule upon your needs. 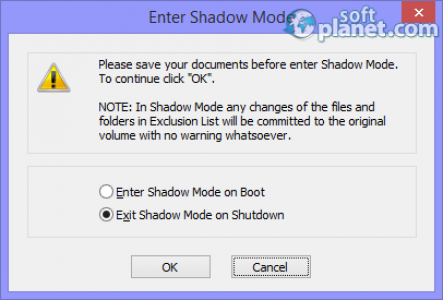 The File Exclusion List tab is where you add files and folders that you wish to exclude from the shadow protected volume. When certain apps or processes want to access these files and folders, all performed changes will be committed to the original volume automatically. Users can also add Windows registry items that will be excluded by the program and any changes will affect them as well. The Administration tab is mostly filled in with checkbox items. Some of them are enabled by default, but you can change that if you want to. Password control and shell integration are two of the possible things to tweak. In addition to that you can click on More Details to change the threshold space size. 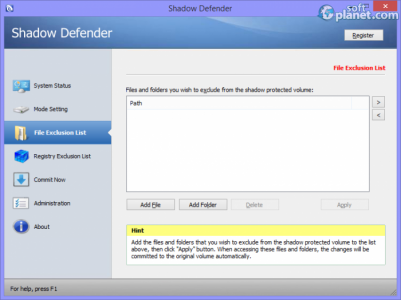 Shadow Defender 1.3.0 does not come with a help file, but helpful information about it can be found on the developer's website. The straightforward application requires moderate-to-high CPU and system memory resources and it is pretty responsive to commands. We have not come across any issues during our tests; Shadow Defender did not cause the operating system to freeze, crash or pop up error dialogs. Thanks to its intuitive layout, first-time users may seamlessly figure out how to use this app. 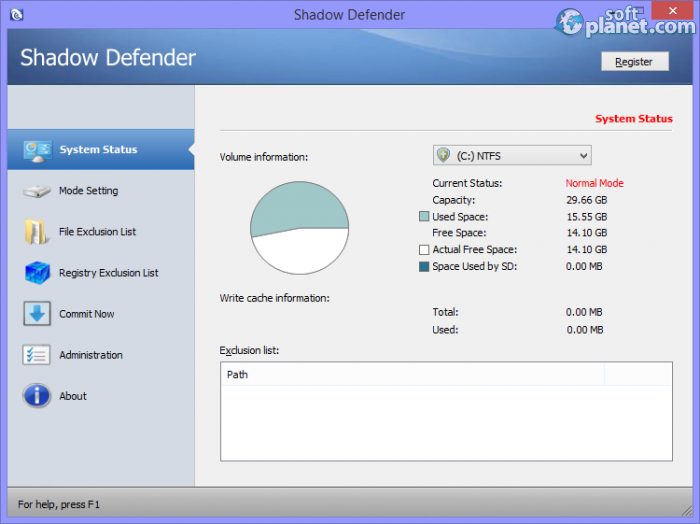 Our security scan shows that Shadow Defender is clean from viruses. 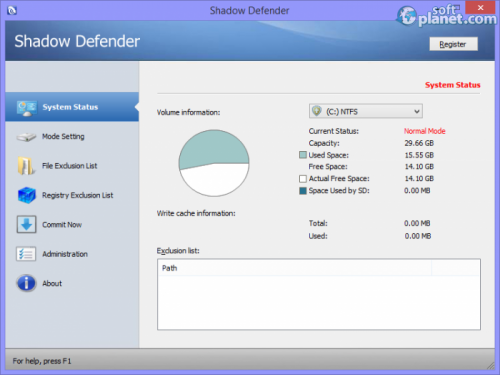 The current version of Shadow Defender has been scanned by our system, which contains 46 different anti-virus algorithms. 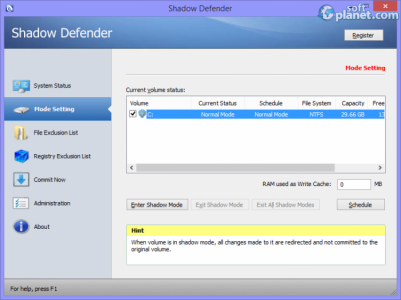 That ensures that Shadow Defender 1.3.0.457 is 100% safe for your computer.